A how-to guide for carpooling with The Mountaineers, including carpooling best practices, how to arrange carpools, carpool etiquette, reimbursement rates, and park and ride information. As stewards for outdoor conservation efforts, The Mountaineers actively encourage participants to carpool as an effective way to decrease our environmental impact and reduce the number of vehicles at trailheads. Plus it’s a great way to meet other people participating in your adventure! We do ask, however, that carpooling be self-selected and organized by the participants independently of The Mountaineers. By allowing self-selection, the individual is responsible for making appropriate choices to ride with a driver they believe is safe and responsible – and drivers can have more choice about who is riding in their vehicle. The Mountaineers insurance will not cover the liability associated with driving or the arrangement of carpool participants by Mountaineers volunteers or staff. Drivers and riders who choose to participate in carpools to Mountaineers programs are doing so at their own risk. All trips formally begin and end at the trailhead or launch point. Thank you for being a responsible member of our community. Be on time (remember to exchange cell phone numbers and prearrange how long you are willing to wait if someone is late). Offer to pay for the ride - don't wait for the driver to ask! This should include consideration of wear-and-tear on the car, fuel prices, the distance, and the inconvenience. This is a carpool, not a taxi service. Don't ask for special stops. Consider bringing plastic bags or other provisions to keep mud from getting in the car. Be on time (remember to exchange cellphone numbers and prearrange how long you are willing to wait if someone is late). Be clear about your reimbursement expectations. Don't make unnecessary stops for yourself. If you are concerned about cleanliness, consider providing rubber mats or other provisions to protect the interior and provide a place for muddy boots. Many people utilize the state's Park and Ride system (check the rules about just how long you can leave a car). Find information about our state Park and Rides and consider planning your activity in a way that could make it easier for people to carpool and reduce their impact on the road and trailhead parking lots. Park and Ride parking lots can be big so allow yourself extra time to park and locate your group. Be sure to communicate with your group exactly where you plan to meet. Details such as the make and color of your car, or the type of pack you'll be carrying, will help let others know you are with a Mountaineers group. Dropping a pin on a digital map or sending a specific image of where you like to park in your carpool coordination email can go a long way for ensuring a quick meet up. The Mountaineers has not established a specific carpool mileage reimbursement rate. We suggest estimating the value of the transportation - including the cost of fuel, wear-and-tear, and inconvenience - then dividing this amount by the number of people riding in the vehicle. Again, this is all up to the people in the carpool, and The Mountaineers is not a part of this negotiation. As a point of reference, the you may consider reviewing the Standard Mileage Rates set annually by the IRS. Are you the owner of a roomy, all-wheel drive car who frequently finds themselves driving without receiving any reimbursement? Consider mentioning in your emails about carpooling that you are happy to drive if folks are willing to chip in some money for gas, or ask the leader sending out the trip logistics email if they can mention reimbursement for drivers. Do you frequently find yourself without cash to pay reimbursement or to make change? Consider downloading a free app like Venmo which allows you to transfer funds electronically to your Mountaineers carpool mates with a simple click. These apps also let drivers accept money from riders in their vehicle. When completing your carpooling preferences, it is generally helpful to include information such as your cellphone number, where you live, how many passengers you can accommodate as a driver, and any other preferences (such as allergies) that are important to you. 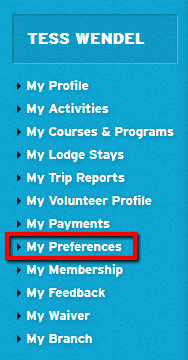 Those preferences are then carried into your activities by default, however, you can further edit them for each activity without modifying the default settings from your profile.This means that if you generally like to drive, but your car breaks down the week before one of your upcoming trips, you don't have to change your default preferences - you can edit your carpool notes for the affected activities with a notes about your specific circumstances. 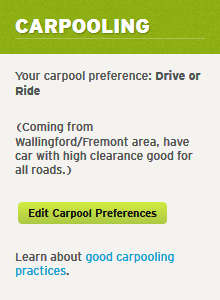 It is important to remember that setting your carpool preference does not automatically "create" a carpool or guarantee you a ride or passengers. This is up to the participants and is not organized by The Mountaineers. Start a dialogue with the participants on your activity via the "Email Roster" button in the activity roster to identify someone you can ride with or drive After the trip, you can use this same communication functionality to exchange photos, say "thanks," or otherwise stay in touch. 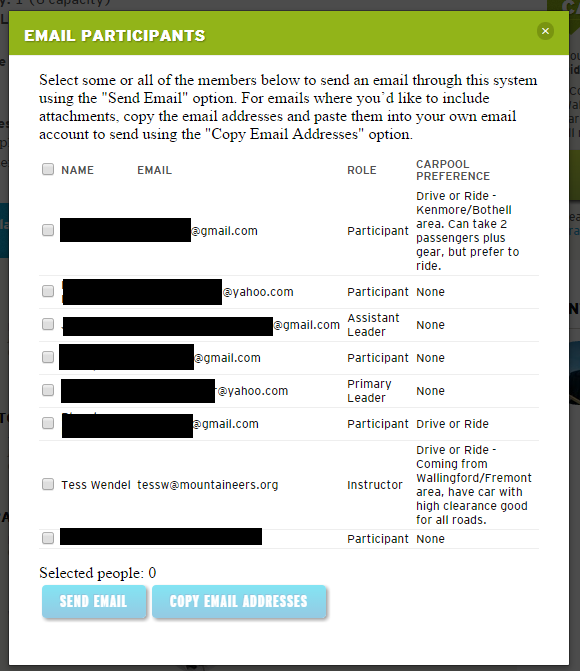 After clicking the email roster you'll see this screen where you can pick individuals to email. Note that only those whose profile is "viewable" are displayed unless you are a leader. Then, once you've arranged your carpool, you may want to update your activity's carpool notes accordingly if you want to avoid additional inquiries. There are carpool statuses available for you to update if you are already carpooling and have a full car or want to carpool and still have room in your car.